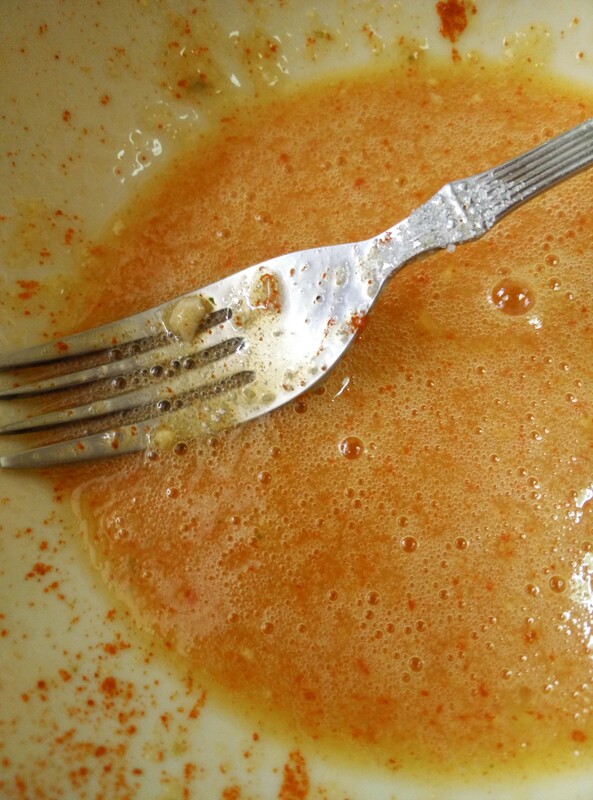 This dish commands extreme reactions–you either love it or hate it. There are no in-betweens. If you haven’t tried, I suggest you must, at least once, just to know what it tastes like. And then knock it off your bucket list. You could try a plain cutlet like this one that keeps the brain’s taste and texture intact, or you could make a scramble by adding onions, tomatoes, coriander and the goat’s brains of course. If you are not sure of being able to handle the texture and the look and feel of the brain, go for the scrambled version. 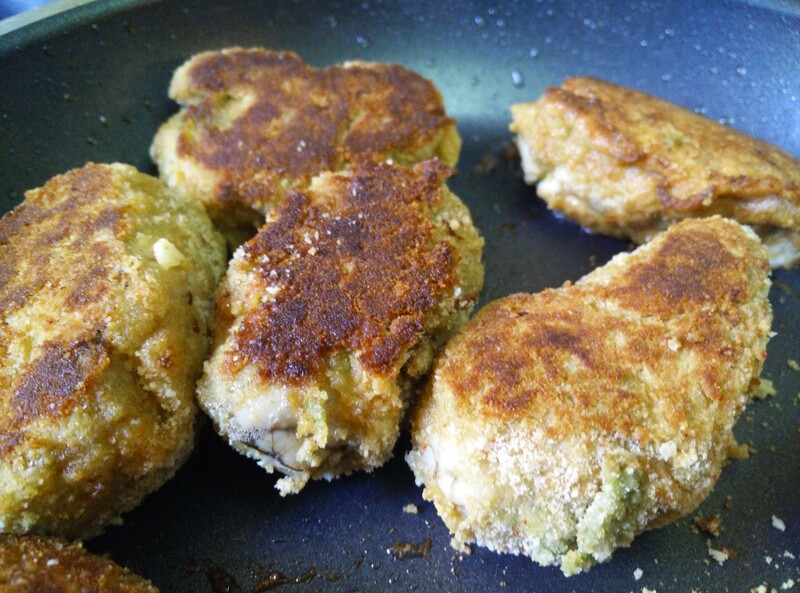 This recipe however is of the brain cutlet. Grind all the ingredients with water to a paste. Squeeze the lime at the very end. This chutney can be used as an accompaniment with any dish. 1. Take 500ml of water and add 2 teaspoons of water to it. Carefully place the brains in this salted water and put on a burner till the water boils. (Make sure the brains are completely submerged) Do not let the water boil as it will fracture the brains. Once the water burns, take it off the heat. And strain the brains out. Will take approximately 10 minutes. 2. Once the brains cool off, cut it into three of four pieces, depending on size of the brains and then with nimble fingers try and take off as many thin veins as you can. Marinated in green chutney and ready for the next process. 3. 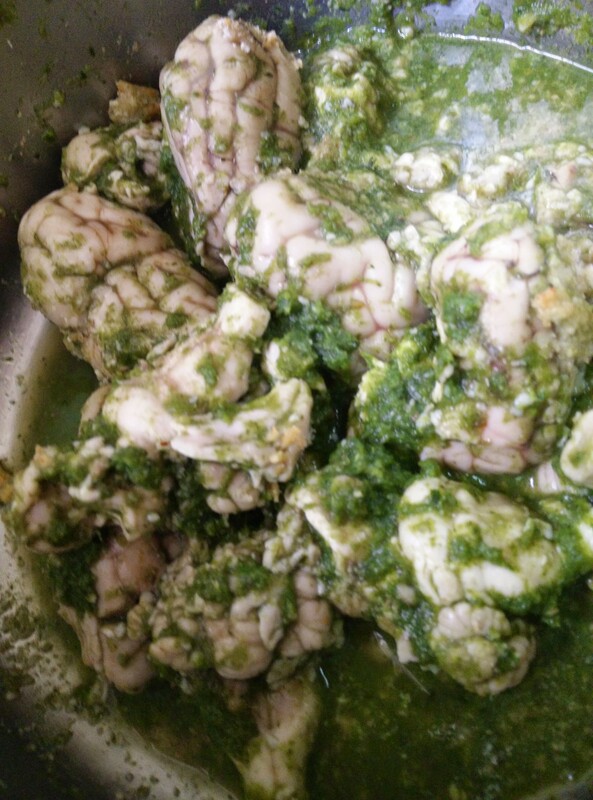 Marinate the brains in the green chutney for at least an hour. The egg dip: a simply egg wash that takes any simple dish one notch higher and crispier. 4. In another bowl, break the eggs, add salt, indian masalas and beat. 5. In a third bowl, place the breadcrumb and season it carefully with salt and black pepper powder. 6. In a shallow pan, add 1 tablespoon of oil. 7. One by one, coat the pieces of brain with the egg wash, then dip it in the breadcrumb and again in the egg wash. Place these coated pieces in hot oil and shallow fry them till they are golden on the outside. Do not add to much oil when your fry the brains. However if you wish you could deep fry these cutlet too. 8. Once done serve with green chutney as a starter. Or with a meal as an accompaniment.